President Abdel Fattah el-Sisi launched Wednesday the first phase of a project aimed at expanding Egyptian farmland by 20 percent. The “Million Feddans” project is a national project that has come at the forefront Sisi’s agenda since he assumed office in June 2014. 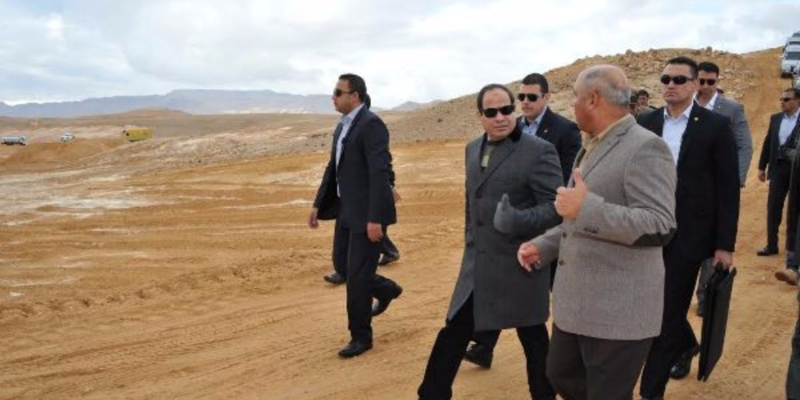 In August, Sisi ordered that the reclaimed area be increased to 1.5 million feddans (630,000 hectares). The first phase aims to expand farmland in the Farafra Oasis in the New Valley province, located in Egypt’s Western Desert. According to the state news agency MENA, the Farafra project covers 10,000 feddans that consist of 40 groundwater wells and three model villages, and it will be inhabited by new communities that will have agricultural, industrial and service-oriented activities. Agricultural Minister Essam Fayed said that 7500 feddans have been cultivated in Farafra, including 1500 feddans in wheat and 6000 in barley as a nucleus of a project that seeks to cover the need in grains and forage, MENA said. The minister added that an extensive campaign will be launched to market the project in Egypt and abroad. Sisi has focused on mega-projects such as the “new Suez Canal” project, which involves building a 35-km-long canal parallel to the current Suez Canal and deepening and widening the canal, and another longer-term project that aims to develop the canal region. Sisi’s economic policies have been met with mixed reactions, with some analysts saying that mega-projects could potentially boost the economy while others are skeptical about these projects’ revenues and economic impact. For example, Egyptian telecommunications tycoon Naguib Sawiris criticised the Suez Canal project in June in a phone-in interview with TV host Amr Adeeb, for lacking adequate planning. Years of political turmoil have taken a toll on Egypt’s economy, halving the state’s foreign reserves and driving away tourists.